Think about the things you spend as little as $10 per month on (a couple of lunches, coffee every morning), or $20 per month (a few movie rentals or music downloads), or even $50 or $100 per month (dinner and movie). Can you help support Rescue One instead? By setting up a monthly tax-deductible donation, you are helping Rescue One provide shelter, medical care, rehabilitation and behavioral enrichment for hundreds of homeless, injured and neglected animals each year. Helping more pets in need: Monthly giving helps us save more animals’ lives; every penny goes further as there are no administrative costs involved. Convenience: Easily track your charitable contributions and eliminate check writing. Provides a collar and leash to one of our new rescues. Provides flea/tick and heartworm preventative to an animal in our care. Provides all vaccinations for an incoming animal. Allows us to spay/neuter an incoming animal. Allows us to spay/neuter and provide vaccinations to an incoming animal. 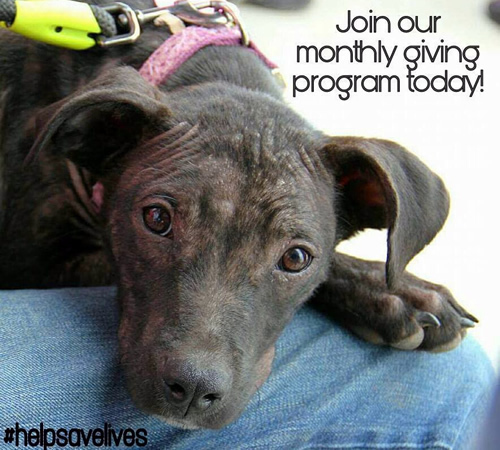 Sponsors the adoption fee for the animal of your choice monthly. Provides heartworm treatment for a heartworm positive dog. Allows us to spay and neuter an average litter of puppies. Provides lifesaving or orthopedic surgery for one dog. We appreciate your monthly gift of any amount because every dollar enables us to continue our lifesaving and life-improving efforts for animals in need! By donating to Rescue One you will give hundreds of innocent animals the second chance they deserve. Please make your choices below and click “Donate” to check out via PayPal. Note that giving monthly requires a PayPal account. If you do not have one, you will have the opportunity to create one during the checkout process. Thank you!